Ignatius of Loyola taught a spiritual discipline of reviewing our daily lives to discover the presence of God. He recommended we do it daily, weekly, monthly, six monthly and yearly. So, in the great tradition of Ignatian spirituality, I have decided to find out what I have learnt this year. I’ve learnt that I never kept any of my New Year resolution because I did not make any. I’ve learned that God answers prayers, but often not in ways we expect and that He has a sense of humour. I’ve have learnt that no matter how many bookshelves I build, there is never enough room for my books. I’ve learned that God works slowly, but His work is excellent and everlasting. I’ve learnt that compassion for the poor involves giving, but sacrificial giving is very painful. I’ve learnt that I am so much in a hurry that most of the time my soul is playing ‘catching up’ with my body. 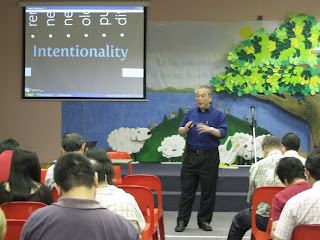 I’ve learnt that spiritual formation takes time and I am very impatient. I’ve learnt that a 10 day silent (no talking) retreat is a torture but God got through to me. He could have called me on my hand phone, He has my number. I’ve learnt that no matter how many times I have read the Bible, there is always new truth/meaning waiting to be discovered. I’ve learnt that most people prefer spiritual fast food than a wholesome Christian meal. I’ve learnt that the Holy Spirit speaks to me but I have to lower my ambient noise to hear Him. I’ve learnt that saying “no” is harder than saying yes but I need to do ‘the one thing needful’. I’ve learnt that there is no point worrying about what people think of me because they never think of me anyway. I’ve learnt that in the name of reformation, we have often thrown out the baby with the bathwater so there are many babies lying around. I am looking around to pick up a few. I’ve learnt that teaching may not lead to learning, but learning involves teaching. I’ve have learnt that after saving a child’s life, the parents will come back to complain about the bill. I’ve learnt that God does heal in response to prayer but in His own way and timing. I’ve learnt that the universe does not revolve around me. I’ve learnt that I love to do research and write, but I am not very good at it. I’ve learnt that the congregation never remember the main points of my sermons but they remember my jokes and wisecracks. I’ve learnt the need to connect with our young adults because they are the next generation of leaders. I’ve learnt that the Internet is a vast communication network and resource and that people actually read my blogs. I’ve learnt that it is easier to loosen my belt than to lose weight. I’ve learnt that we need to appreciate and love our friends, because God may call some home early. I’ve learnt that after 40 years, Star Trek fans are still baldly going where no man has gone before. I’ve learnt that pain is a good teacher, but I prefer to learn from a book. I’ve have learnt that parents expect doctors to have no other life other than to be there when they want them. I’ve learnt that I enjoy my comfort zone but travel moves me out of it. I’ve learnt that believing my body is 10 years younger does not necessary make it so. I’ve learned that the shoring up of my gardens is expensive, and my contractor now enjoys his new Mercedes. I’ve learned that I am attached to BMWs, but a Toyota can get me around just was well. I’ve learnt that most people cheat at their golf scores. I’ve learned in Rome never to believe someone who claimed his restaurant to be 100% Italian because his wife made the pasta, as the food is hearty and so is the bill. Socrates taught that an unexamined life is not worth living but see what happened to him! However God has been good to me and my family this year. I have learnt a lot and I look forward to learning more next year. The Teacher in Ecclesiastes end with “Now all has been heard; here is the conclusion of the matter: Fear God and keep his commandments, for this is the whole duty of man. For God will bring every deed into judgment, including every hidden thing, whether it is good or evil.” (Ecc.12:13-14). Enjoy my haiku and blessings for 2007.
now I need to turn down some "noise" and start writing down "what I've learnt in the year 2006." isn't it interesting to know that people remember the jokes and wisecracks. I am now more aware and try to use the jokes and wisecracks to emphasis the points of the sermon. I shall look forward to learning from what you have learnt in 2006, especially from origami.